April showers bring May flowers … and with rain brings cravings for hot soup. I used to be too intimated to make homemade soup. I believed there was certain artistry or craft behind it, a skill I had yet to learn in the kitchen. Well, if I’ve learned anything so far from making these recipes, it’s that skills are not made until you try and you’re not going to succeed until you’ve failed a few times. Get a healthy meal out on the table as quickly (or as easily) as possible. Make a mouthwatering meal that will make you feel like a master chef. If I’m being honest – most people want something that’s BOTH as fast as possible and as delicious as possible. Either way, a slow cooker soup is going to get you both of those outcomes and fill your house with warm, delicious aromas for hours! The first step in adding flavor to this soup is sautéing the vegetables, onion and garlic with extra virgin olive oil before adding them to the crockpot. I then add the spices and tomato paste to this pan. These few extra minutes allow the spices to really open up at that high temperature and the tomato to take on some more flavors rather than remaining flat. Last to the pan are canned tomatoes. This will bring up their temperature and infuse them with the flavors of oil, garlic, onion, cumin and coriander. I’ve used canned tomatoes in this recipe. These are not only a money saver while tomatoes are off-season, but canned hold up better in soups and sauces. Look for “no added sodium” and brands like Eden for BPA free cans. All these steps took less than 20 minutes to prep and cook before putting in the crockpot. This extra time will give depth to your soup and will fill it mouthwatering flavors. However, we all have those weeks where every single minute counts. In that case, simply cut the veggies, throw everything in the Crock-pot and turn it on high! The spices will not be as intense, but the soup will still be delicious. Bay leaf is an added boost of flavor in the soup, which slowly releases throughout the slow-cooking process. I recommend using bay leaf if you have it on hand, but feel free to omit if you don’t want to spend extra money on spices. 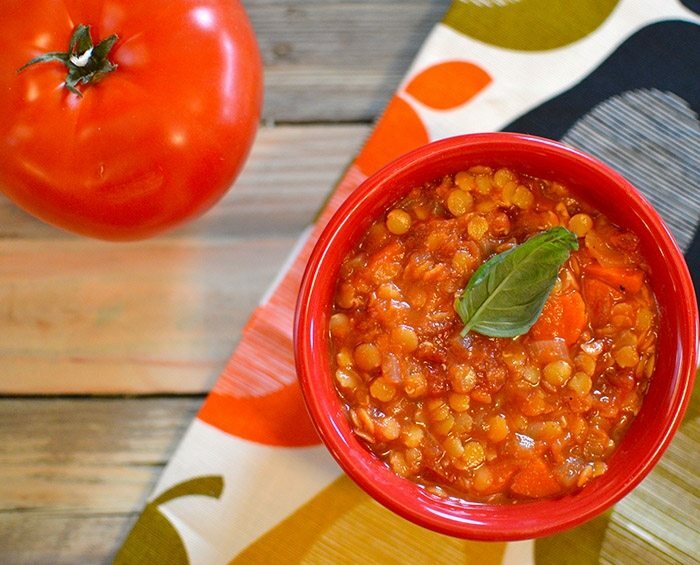 Lentils are the other major key to this recipe. This heart healthy food is a top “super food” contender because they offer a huge range of health benefits and really, there isn’t anything bad to say about them! They’re a great source of protein, low in calories, great for digestive health, full of nutrients like iron, folate and magnesium … need I say more? To me, soup is easy, convenient and comforting – perfect to bring to work and makes for successful food prep. 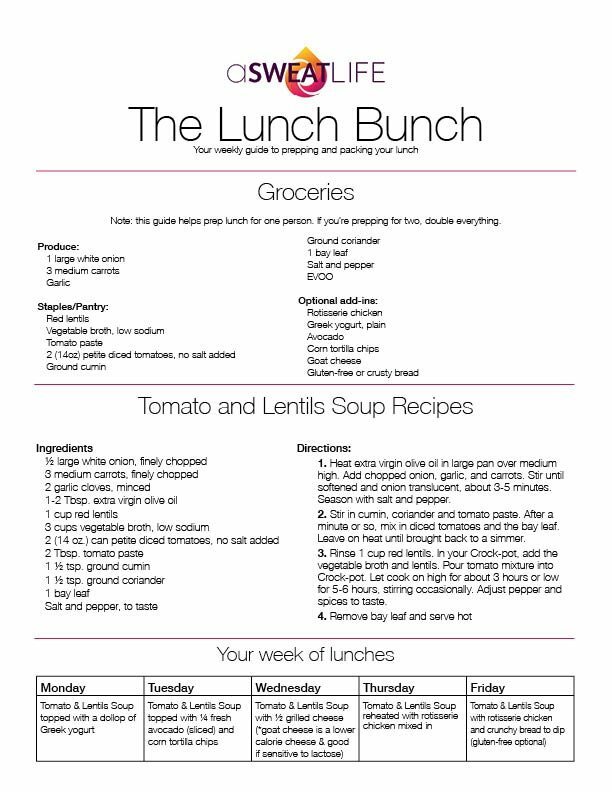 This soup will make around 5-6 servings for Lunch Bunch and also freezes well. Add rotisserie chicken for more protein, top with avocado for some extra healthy fat and a Mexican flare, or serve with some Greek yogurt in substitute of sour cream. Make it your style and enjoy! Grab the packing and prepping guide here. Heat extra virgin olive oil in large pan over medium high. Add chopped onion, garlic, and carrots. Stir until softened and onion translucent, about 3-5 minutes. Season with salt and pepper. Stir in cumin, coriander and tomato paste. After a minute or so, mix in diced tomatoes and the bay leaf. Leave on heat until brought back to a simmer. Rinse 1 cup red lentils. In your Crock-pot, add the vegetable broth and lentils. Pour tomato mixture into Crock-pot. Let cook on high for about 3 hours or low for 5-6 hours, stirring occasionally. Adjust pepper and spices to taste. Food Labels 101: Breaking Down "Organic", "All-Natural" and "Non-GMO"